Putting The Fun Into Backpacking Food! It's true! Backpacking food can be a lot of fun! And when planning your backpacking trip, it is important to pay special attention to the issue of food. Backpacking is a physically intense activity. Having nourishment for the journey is essential to a safe and fun backpacking experience. It is important to bring nutrient dense items that fill you up and fuel your body. It is not unusual for your body to require 3,000-4,000 calories a day on a backpacking trip, with that number increasing by 2,000-3,000 calories for winter backpacking trips. Meal planning for your trip doesn’t have to be a daunting task. It might seem like a lot of work, but with practice you can be a pro! So, don’t worry; our tips can help make the process easier. Visit our page on planning a backpacking menu for helpful information. Backpacking recipes are a great option for those who don’t want the extra poundage or expense of pre-packaged food. You can easily make your own meals with ingredients found at your local grocery store. We have some great tips for pulling together great food. So, for a fun and easy alternative to pre-packaged meals, visit our backpacking recipes page! Get creative with your food! Don’t forget food can be found at more places than sports and outdoors stores. Take a trip to your local grocery store. There are many ready-to-go food items that are perfect for backpacking trips. 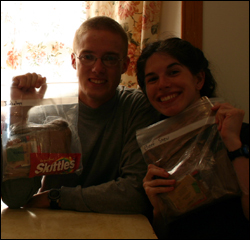 Check out our page on ideas for backpacking meals for more info. Being healthy isn’t hard either. For those who are interested in more natural food products, don’t worry. There’s plenty of stuff for you too. Learn about your organic backpacking food options.